HiSec Super 6 358 mesh has been developed in consultation with the Home Office as our premier high security system. 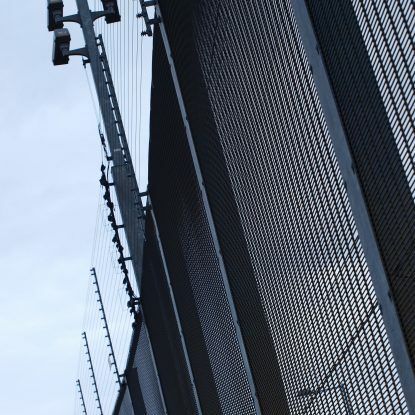 The HiSec Super 6 358 mesh is aimed at high profile and sensitive sites that require greater perimeter protection. HiSec Super 6 358 is based on the standard HiSec 358 mesh system but is even stronger, presenting a formidable barrier to anyone trying to gain unauthorised access to key assets and sites. The 4mm horizontal wires remain the same as the standard HiSec 358 mesh, however HiSec Super 6 358 features 6mm diameter vertical wires with 76.2mm spacings. 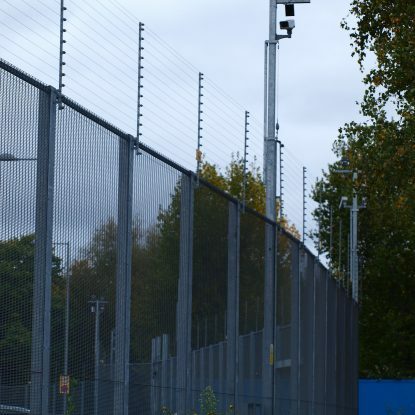 The mesh pattern remains at 76.2mm x 12.7mm, ideal for use with CCTV cameras with excellent visibility on anyone trying to breach the perimeter. Slotted fixing holes ensure the installation is easy and leaves a neat, flush fitting. HiSec Super 6 358 can also be used with a range of fence toppings and integrated solutions to provide a full turnkey high security solution. Pedestrian and vehicle gates are also available to match the fence line. Pedestrian gates are single leaf 1.2m wide, (or width to suit). Framed in a 100mm x 50mm RHS with Zaun HiSec Super 6 mesh bolted to the frame, with slide latch. Each gate features a rubber bump stop and 2 x suitable gate posts. Vehicle access gates are double leaf (single leaf vehicle gates available) 3.0m wide (or width to suit). Framed in 100mm x 50mm RHS, with Zaun HiSec Super 6 bolted to the frame, with drop bolts and slide latch. Each vehicle Gate features a rubber bump stop and 2 x suitable gate posts.